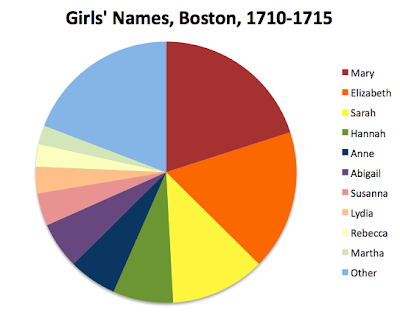 I've compiled the name data from the Boston Birth Records for the years 1710-1715 in order to get a better picture of the popularity of given names as mentioned in my earlier post. I have a much larger sample this time: 818 girls and 885 boys. The top names are overwhelmingly popular. 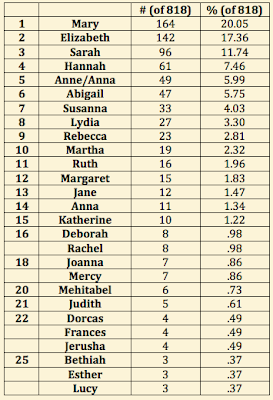 For girls, the top three names account for 49% of all names and the top ten account for 81%. 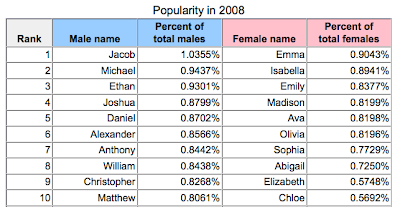 For boys, the top three names account for 39% of all names and the top ten account for 69%. Compare these numbers with their modern equivalents: today's top 10 names account for less than 10 percent of all names given in a single year. Also, I was astonished by the number of different boys' names (116) vs. girls' names (61). The male names are taken from the Bible, traditional English names, and surnames, while the girls' names are Biblical, English, and virtue names. 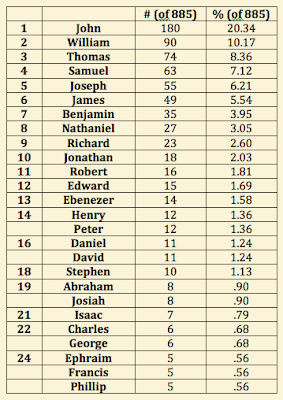 I suppose it makes sense that a mostly Bible-based name pool would yield more male names, but I wasn't expecting twice as many. Yet, I am also surprised by the Biblical names that are not on this list. As David Hackett Fischer noted in Albion's Seed, there were oodles of New England men named John, but not many named Paul, Mark, Luke, or Matthew (none in my sample). It seems that these Bostonians may have recognized three distinct classes of Biblical names: Old Testament names, New Testament names that were already popular in England, and New Testament names that had shallower roots in England. The first category gives you Abraham, Isaac, and Ephraim, the second offers John and Thomas, and third might include names like Andrew and Bartholomew. The third category is not well represented on the top 25 list. What accounts for the abundance of English, non-biblical names among the top 25 names in Boston? Did the practice of naming children for their parents (as outlined by Fischer) preserve a thread of Englishness in naming practices? Was 18th-century Boston more worldly than 17th-century Windsor? Was Boston home to increasing numbers of immigrants, English and otherwise, during the first decades of the 18th century? These are all questions historians have been chewing over since Bernard Bailyn wrote The New England Merchants in the Seventeenth Century in 1955. 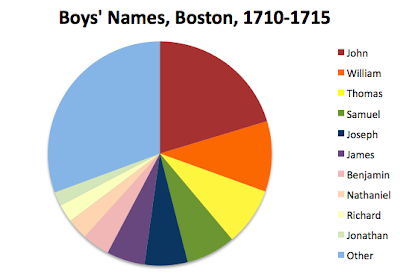 I think that name data is an interesting way of rethinking Boston. What are you using to make your nice looking charts? Just Excel, or something that's blog friendly? They're just screen shots of Excel. I have not yet figured out how to make the background color something other than white. Then again, for the female names, you had a small pool of "full" names and then a whole host of short - and - nicknames. Elizabeth alone must have almost twenty recognised short forms (today at least) and Mary must have some half dozen. Not that you notice many on gravestones tho, or I haven't. I have seen Peggy, Polly and Betty, but not many more. I guess these were the only ones independant enough to be used as full names? Inspired in part by posts such as this one (having enjoyed your blog for awhile), we at the Utah State Archives compiled some top names lists for Utah based on 100-year-old birth certificates. Similar to the Social Security lists, we did not adjust for various spellings, but it is still an interesting glimpse into history. Actually, I've read that it's actually a Catholic/Protestant identifier. The Protestants specifcially started choosing Old Testament names more often to distinguish themselves from Catholics, who would name their children after New Testament saints. I love Mercy and Bethiah from the girl's list and Ephraim, Josiah, and Francis from the boy's list. I love a lot of others too, but these are more unique choices and it fits with how I picture the names that they were used in Boston in 1710. I thought the same thing about them not using some New Testament names, as that might have more of a tie to popes or Catholic saints. You'd want to look at two things though, to know. More than one year and who they were named for, since usually these children were named for a family member.